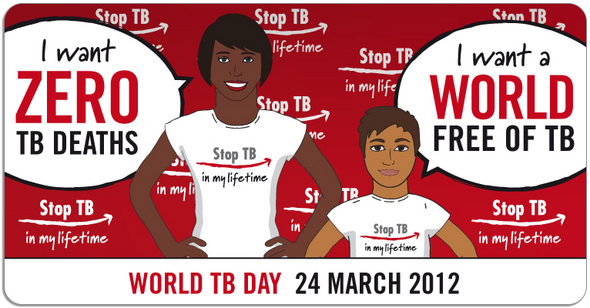 Posted on Wed, Mar 21, 2012 : 9 a.m.
Each year, we recognize World TB Day on March 24, often with a variety of activities leading up to the official day. This annual event commemorates the date in 1882 when Dr. Robert Koch announced his discovery of Mycobacterium tuberculosis, the bacillus that causes tuberculosis (TB). World TB Day provides an opportunity to raise awareness about TB-related problems and solutions, and to support worldwide TB-control efforts. The CDC and their partners are committed to a world free of TB. This year, CDC joins the global Stop TB Partnership in adopting the slogan “Stop TB in my lifetime” that goes with the theme of calling for a world free of TB. The slogan and theme encourage people all over the world, from the youngest to the oldest, to make an individual call for the elimination of TB, and say what changes they expect to take place in their lifetimes. In their lifetimes, today's children should expect to see a world where no one gets sick with TB. In their lifetimes, women and men should expect to see a world where no one dies from TB. All of us can have different hopes, such as for faster treatment; a quick, cheap, low-tech test that is accessible to all; or an effective vaccine. Contact the TB program at Washtenaw County Public Health at 734-544-6700.